Here we can see a bus stop bypass on Wilmslow Road that is not ideal. The cycle lane has been taken behind the bus stop, but there was no space to provide a continuous pavement, so all pedestrians will have to cross the cycle track to the bus stop island and then cross back. I don't know the area, so I do not know if this is a busy location. I think that this is an acceptable compromise. It is better than having buses cross the cycle track twice, as cycle users pose far less risk to pedestrians than buses pose to cycle users. 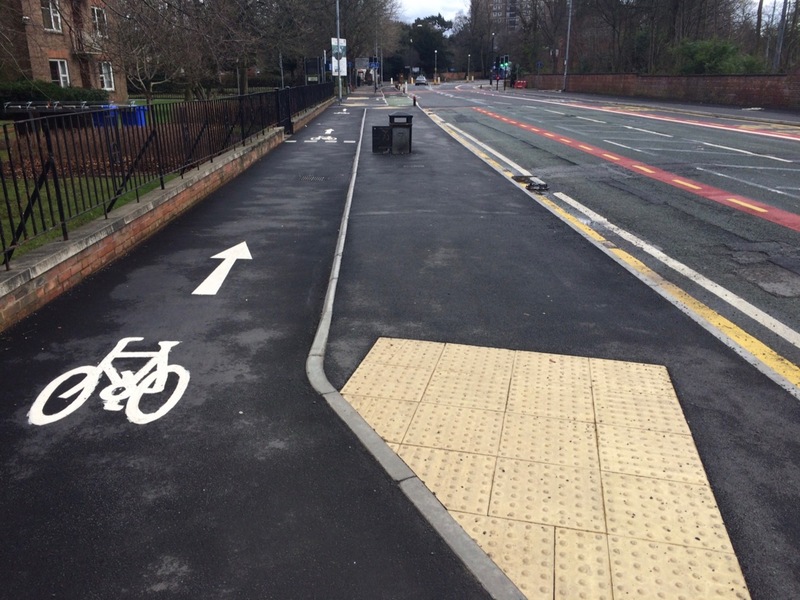 And it is good to have a clearly demarcated cycle track, so that pedestrians can predict where the cycle users will be going and can avoid them. This is better than a shared use pavement, and is a better compromise than a shared use pavement would have been.